Punch Factory Outlets in Australia have a full stock range and great stock levels to ensure your personal or commercial requirements are met on the spot 99% of the time. They will also honour Punch® wholesale pricing to Personal Trainers, Coaches, Gyms and Clubs plus Government bodies. Punch Retail Outlets run a core range of boxing equipment ideal for those training at home or down at the local gym. If you're looking for Punch Equipment boxing gear Adelaide find a store in Australia using our website. If you're looking for Punch Equipment boxing gear Brisbane find a store in Australia using our website. If you're looking for Punch Equipment boxing gear Canberra find a store in Australia using our website. If you're looking for Punch Equipment boxing gear Gold Coast find a store in Australia using our website. If you're looking for Punch Equipment boxing gear Melbourne/VIC find a store in Australia using our website. If you're looking for Punch Equipment boxing gear North QLD find a store in Australia using our website. If you're looking for Punch Equipment boxing gear Northern NSW find a store in Australia using our website. If you're looking for Punch Equipment boxing gear Perth find a store in Australia using our website. If you're looking for Punch Equipment boxing gear South East QLD find a store in Australia using our website. If you're looking for Punch Equipment boxing gear Sunshine Coast find a store in Australia using our website. If you're looking for Punch Equipment boxing gear Sydney/NSW find a store in Australia using our website. 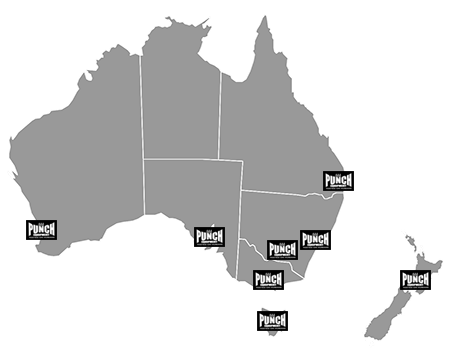 If you're looking for Punch Equipment boxing gear Tasmania find a store in Australia using our website.